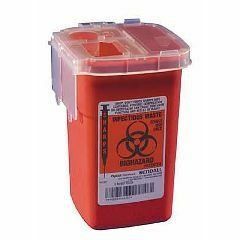 Phlebotomy Sharps Containers is a portable phlebotomy containers that fit into present blood drawing trays for the efficient disposal of blood, hypodermic and IV needles. These containers facilitate temporary and final closures in a variety of sizes and colors. The whole purpose of this item is to dispose of sharps properly and safely and this is an excellent product for such purpose. Are these containers disposable and where would you dispose of the needles that have been trashed? They are disposable, but there are pretty strict regulations on how you can dispose of them as they are considered medical waste when used/filled. There are companies that specialize in disposing of the containers.